Since so many of you really seem to like my review of the Power Rangers Legacy Morpher, I decided to give into my impulses and pick up the Legacy Megazord as well. As I mentioned in my Morpher review, I wasn't into the Mighty Morphin Power Rangers for too long, but, like a catchy pop tune, my time with the Rangers was short, lively, and something that I look back on with equal parts nostalgia and embarrassment. Thinking back, there was absolutely no reason for me to be running around in all blue clothes and shouting "Triceratops" at the top of my lungs. I do have some fond memories, such as seeing Power Rangers Live twice, collecting Power Rangers pogs from McDonald's, and hearing my dad one day shout that he didn't ever want to hear the words "Power Rangers" uttered in his house ever again. Well, guess what? Now I live in my own house and I say Power Rangers as often as I want. Sometimes my wife will say "What do you want for dinner?" "Power Rangers!" I shout! (If I'm feeling really feisty, I'll randomly yell "V.R. Troopers!" just to shake stuff up. That's how I roll.) (**Editor's note: Now I know how your dad felt. **) OK, so I guess you didn't come here to hear me ramble on about nothing, but instead to hear about the Legacy Megazord? Well, let's bring 'em together and get on with the review/FAQ. After the break, of course. How does the Legacy Megazord come packaged? It comes in a large green box with images of the Megazord and the various Dinozords on it. I think it's exclusive to Toys R' Us. To get the full 90's nostalgia experience of finding Power Rangers merchandise when you buy it, the store actually has an elderly grandmother, a tiger mom, and a snot-nosed 8-year-old with chicken pox trying to get the box from you. I used a foam Thor hammer to ward off grandma, scared the brat off with a well-timed hadoken, and distracted Tiger Mom with my roguish charms. I also had to knock over a few scalpers, but I don't think the store hired those guys. Inside the package, the Dinozords are sitting in a formed cardboard tray that can easily be reused to store the figure. What all comes in the box? The package includes the five Dinozords (Tyrannosaurus Zord, Pterodactyl Zord, Mastodon Zord, Sabertooth Tiger Zord, and Triceratops Zord), both of the thunder cannons, the Titanium Power Sword, and a pack of stickers. Mine also came with a personalized autographed picture of Amy Jo Johnson, but I can't guarantee yours will. Actually, I can pretty much guarantee yours won't. Sorry, bro! What are the Dinozords made of? Reused plastic from a variety of older Japanese toy lines. OK, just kidding. They're actually a mixture of metal and plastic. While most of the Dinozords are plastic, there are some nice die-cast metal pieces that add some heft to the figure. Four of the five Dinozords feature some die-cast metal part (not the Pterodactyl Dinozord, because metal would make it too heavy to fly). I'm guessing that safety reasons dictated that Megazord's sword not be metal, but that would have been awesome if it were. You could have simultaneously armed your Megazord and practiced your knife throwing act at the same time. There's not as much metal as I hoped for, though. Tell me about the Mastodon Dinozord. This isn't a question, it's a command! Geez, you're pushy. Well, he's short, squat, and basically just stands around. While there is articulation to aid in the transformation for the arms and shoulders of Megazord, there's no usable articulation for the Mastodon itself. The silver parts of the arm are actually metal, but everything else is plastic (or plastic painted to look like metal). Most of the details are accomplished through shiny metallic stickers, although the green eyes, as well as the little yellow and red stripes on the sides, are painted on. I wish the trunk was articulated, but it's not. The head is removable to serve as the shield. Tell me about the Pterodactyl Dinozord. Well, she's all plastic but does have a nice metallic red paint for the chest piece. The wings can fold, and the head is hinged at the top and bottom of the neck. The wings look really, really small. Much smaller than I imagine they should be. They're dinky. The Megazord's "thunder cannons" can actually snap onto the bottom of the rear fins and allow the Pterodactyl to stand up straight. Go on. Can we hear about the Triceratops Dinozord? Sure. It's a blue, robotic Triceratops. The only articulated parts are the hinged neck and the hinged tail (which is actually made of metal). There are no wheels on the bottom or anything (which is kind of lame), but the paint on the head and the metallic stickers on the body are pretty cool. You know, the Dinozords really don't do much on their own, do they? The only one that seems like it could be useful by itself is the Sabretooth Tiger Dinozord. Are we going to hear about that one next? Yup! The Sabretooth Tiger Dinozord also has a diecast metal tail and features four legs which can swivel into place. The head's also hinged to facilitate the transforming action. Oh, and you can swivel and remove the teeth. Don't lose them, though--they're pretty small. She's probably my favorite Dinozord. Alright, let's finish this with Tyrannosaurus. Tell me more! Ok, well Tyrannosaurus is definitely the biggest Dinozord and features metal thighs. The upper and lower jaw is hinged so he can be posed in different biting poses. The little arms and thighs also swivel, and the knees and ankles are hinged. There's a fair amount of paint on old Rexy and he looks pretty impressive. I especially like the sticker detail in his mouth that shows the rocket ports. He did fire rockets from his mouth, right? So, does the Megazord actually work? Do you mean does it actually fight monsters on it's own? Ummm, I haven't noticed yet if it does or not, at least not without me supplying the movement and sound effects. It doesn't seem to be sentient, but you never know. No, I mean does it actually transform? Ah, OK. Yes. Yes it does. There are lots of folding and rotating parts that allow you to take the small army of Dinozords and turn them into the Megazord. Actually, it transforms into two different models. Get the heck out of Angel Grove! Really? Yup. It not only turns into the standard Megazord, but it also turns into the Attack Tank! I kind of remember the Attack Tank, but I'm sure some of you really will, and so this is kind of a big deal for you. It's kind of cool, though, as it gives you a third display option. Are Mastodons and Sabretooth Tigers really dinosaurs? Umm, no. I think they're just mammals. Why'd Saban/Bandai/whomever call them that, then? I don't know. Because kids are stupid? And Mammalzord sounds stupid, too. Well, what's the Megazord like? He's actually pretty cool. There's no way you're going to see this guy and not get overcome with a rush of nostalgia and excitement. It's definitely recognizable as Megazord, and the amalgam of diecast metal parts and metallic paint really sells the look of the Megazord. He's not very articulated, though. The hips (the same as the Tyrannosaurus Zord's) can swivel forward and backward a bit, and the shoulders swivel as well. The elbows are also hinged, but you won't get too much movement out of them. Being a bit more critical, I think the Pterodactyl proportions for serving as the chest plate are wrong. It's way too thick and rear tail/fins/whatever are too large and hang too low. The red of the upper thighs and waist should not be covered by the lower chest plate. It's not a huge issue, though, and other than the thickness, I didn't notice it until I did some research. How big is the Megazord? 333 ft. tall and weighs 172,000 lbs. What? I mean the toy! Oh, sorry. He's 10 1/2 inches tall. He might way a pound or two. Did you like the Power Rangers Christmas Special? Nope. 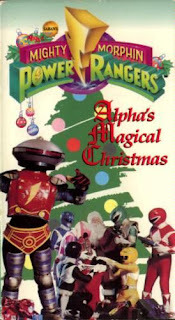 Even as a kid who thought Power Rangers was the be-all-end-all of fine entertainment, I recognized that Alpha's Magical Christmas was pure and utter crap. Seriously, that was definitely one of the biggest disappointments of my childhood--right next to Batman & Robin, and the discontinuation of Hostess' Teenage Mutant Ninja Turtle pies and HI-C Ecto Cooler. Sorry bro. Deal with it. I'm not looking forward to bringing a child into a world without Ninja Turtle Pies and Ecto Cooler, but life's going to happen. Ok, well, do you have any problems with the Megazord? Nothing I haven't already mentioned. I wish he had more metal pieces and was a bit bigger. I also wish the Pterodactyl Zord was better scaled with the others, and that the chest piece it forms was more accurate. Megazord also isn't very articulated, although personally I'm OK with him just standing around looking awesome. How would you rate it overall? Considering that it's available for around $50 to $60 dollars, I'm going to say Great. It's a very nice toy and a nice collector's piece for folks who just want something to remind them of the Rangers, but don't want to commit to anything too crazy, like re-buying the original toys. If you're looking for one Power Rangers item for your collection, go with either this or the Legacy Morpher. Would you buy any other Power Rangers Legacy items? 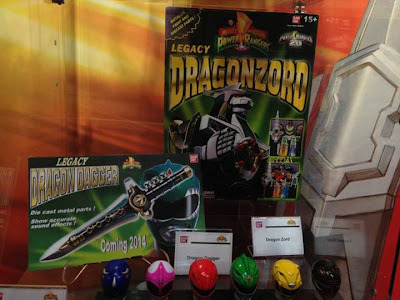 Honestly, I'd consider picking up the Legacy Dragon Dagger and the Legacy Dragonzord. For the price, the stuff is really nice and manages to be very high quality. I'd also grab a Blade Blaster if Bandai ever made one. Well, looks like we're out of time here! Like I said--overall, this is a really good piece. Great, actually. Some better articulation, more diecast metal, and a more accurate chest piece would have gotten the toy a better rating, but Great ain't bad at all. While I'm not a die hard Power Rangers fan, this toy does remind me of a simpler time when wearing clothes of all the same color was cool, the kids danced hip-hop kido, people spent their time at juice bars rather than huffing paint, and no one realized that the majority of our favorite TV show was 95% of the same footage weak after week. Ahh, the good old days. Barbecue17 has an attitude, but alas he is no longer a teenager. He has resigned himself that he'll never be a Power Ranger. Maybe there's an opening at a juice bar somewhere. He'd try to be Zordon, but he's claustrophobic and hates hanging around in tubes.